Your tour starts in central Skagway, where you'll meet your guide and board the bus. (Make sure to bring your passport, required to cross into Canada.) 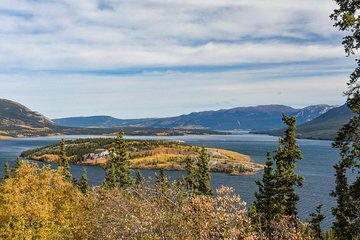 Then head out of town along the 'Yukon Highway,' a route that introduces you to Alaska's and Yukon's vast landscapes of snowy mountains and green meadows, depending on the season. You'll make eight to 10 stops during your tour for photo ops of the natural scenery and hopefully some native wildlife like Dall sheep, moose, caribou, bears, or wolves. Discover valleys, peaks, lakes, and bridges, and try to imagine what it was like during the gold rush days, when men and women dealt with extreme terrain and ever-changing weather in pursuit of riches. Learn about their experiences from your guide, who shares stories of their determination to cross the expansive Yukon. When you reach the 'Welcome to Yukon' sign, turn around for the return journey to Skagway.